Solomit is the only company who manufacture Acoustic Ceiling Strawboard nationwide and has been since 1937. Noise reduction through sound absorption. Natural softness to a room or any undercover area. Thermal insulation, reducing heating/cooling costs. Lightweight and therefore easy to install. An attractive alternative to many traditional products and is made from 100% natural products. 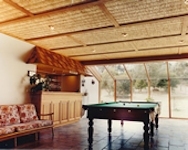 Reduced noise with effective sound absorption of the straw panels. Light weight which makes construction and the installation of the ceiling panels easy. Provides thermal insulation through thermal resistance approximately equivalent to 35mm fibreglass insulation. This can be further enhanced with the addition of other insulation including double sided roofing foil and 50 mm insulation batts. Solomit Strawboard building sheets and materials are 100% grown, harvested and manufactured in Australia, of selected clean wheat stubble compressed straw. The compressed straw is reinforced with galvanised wire running the full length of the sheets and held in compression with wire stitches. The sheets are therefore rigid and support their own width with only one centre fixing when installed correctly. For further information regarding Solomit Strawboard acoustic ceilings and any installation and preparation procedures, as well as side jointing and length details please contact us. Thickness – 25 mm or 50 mm . Length – 1200 mm – 5000 mm. Stock width – 1200, 1220 and 1450mm. Various sizes can be made, upon request. Special Width – 820 – 1500mm. Panels are a made to order product.